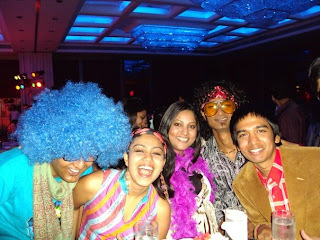 Ok, so some of you have already seen my facebook snaps from the retro party at Le Meridian. Before I start describing each person's behaviour under the influence of spirits, I say "this is one hell of a party!" , that too for a office party! Firstly, because for once after I joined this company, I didn't perform. So I had the luxury to enter like a guest where otherwise, I would have gone along with the performers hours before the party to have stage rehearsals and lost half my day's battery. The performances! I would probably proudly say, they missed that "teeny weeny" touch, I would have added to make the performance larger than life. This being an anniversary party, there was a huge cake and champaign, which obviously was not touched by the "common man"
And then, the bar opened. Do you need me to say more? A bunch of people started waving to the "dum maro dum" tunes and the likes, on the floor and then followed "dirty dancing", which was still ok. The DJ probably need to get back to his zamana and so played 2008 Bollywood numbers and the likes of Ramstein. By now, yours truly was completely confused what to do, because the 70s ambience was lost to headbanging and her funny clothes looked out of place, and so did she! So she just had another drink and then started feeling in place again. V was swaying after the music stopped and R, the kind lady she is, helped V walk on 2 legs and gave him a plateful of food. We all witnessed the over stuffed plate but V claimed the next day that he starved. Anyway, S on the other hand mixed main course and dessert on a single plate and was happily eating away whatever he could shovel out of in his little icecream spoon, while poor P next to him got splashes and sprays. Hmmm...fun!Which one is u in this?